Full round log home on 35 acres in Beckwith Ranch development. This exceptional lot has large, mature pinon and ponderosa pine, massive, unusual rock outcroppings, views of the Sangre de Cristo Mountain range, private setting, easy, year-round access and level ground suitable for horses. 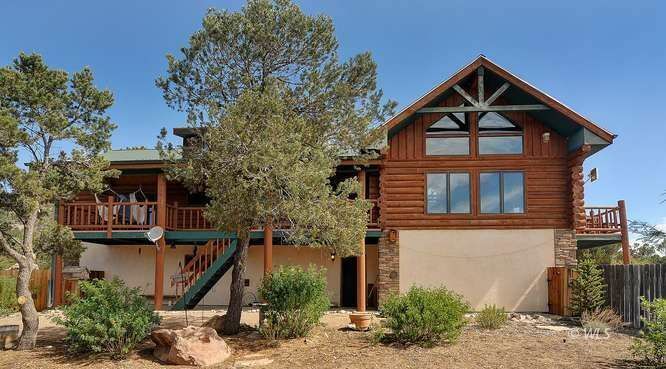 You'll be amazed at how the home has been situated to take advantage of the massive boulder outcrop and towering ponderosa which you pass to the front entry. Main living level is on the 2nd level. Substantial front door made of weathered barn wood & use of rugged, aged barn wood continues throughout the home. The kitchen and dining nook are open to the great room which has vaulted ceilings, fireplace and large windows. There are 7 zones for the Hot Water Baseboard heating making it easy to choose particular zones for heating and saving in heating costs. Decking & fenced yard. This informal log home has 3 bedrooms each with a private bath and a 910 SF attached garage. Home has across from the garage a large 400 + SF rec room. This finished lower level would make a nice mother-in-law apt. MOTIVATED SELLERS!